So, let's start with the basic premise: Consumers are not economists. This means that normal people who have a job and then decide what to do with their hard-earned money often make decisions that economists don't expect. The latest example is when, how much, and why people save money. In short, too much saving means not enough spending means a lack of aggregate demand in the economy, the thinking goes. "Secular stagnation" is another term that might apply. In a note to clients last week, Deutsche Bank's Binky Chadha looked at the relationship between interest rates and savings rates, finding that — of course — consumers aren't exactly acting the way the economists at the Federal Reserve might expect. Namely, people are saving money despite low interest rates when many economists expected or hoped these folks would spend that money to buy stuff or put it in assets that actually earn some return. 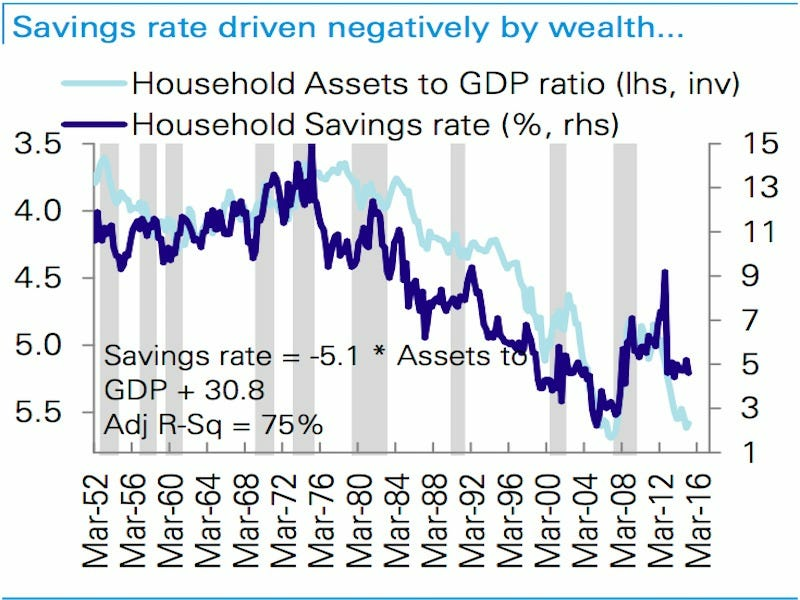 If households save to accumulate a target level of wealth, either to live off in retirement or to bequeath, then an increase in wealth (because say equity markets rise) will see a lower required savings rate; and vice versa with declines in wealth raising the savings rate. In turn, a rise in the savings rate, or what is the same thing a fall in the consumption rate, will lower aggregate demand in the economy. This dependence of the savings rate on wealth is widely recognized, including by various members of the FOMC. This is sort of the "savings glut" idea that people like former Fed Chairman Ben Bernanke have talked about in the years since the financial crisis. Let's consider, then, who benefits most when interest rates are low: borrowers. So we've got governments and businesses primarily benefiting from low interest rates as opposed to households — read: consumers. 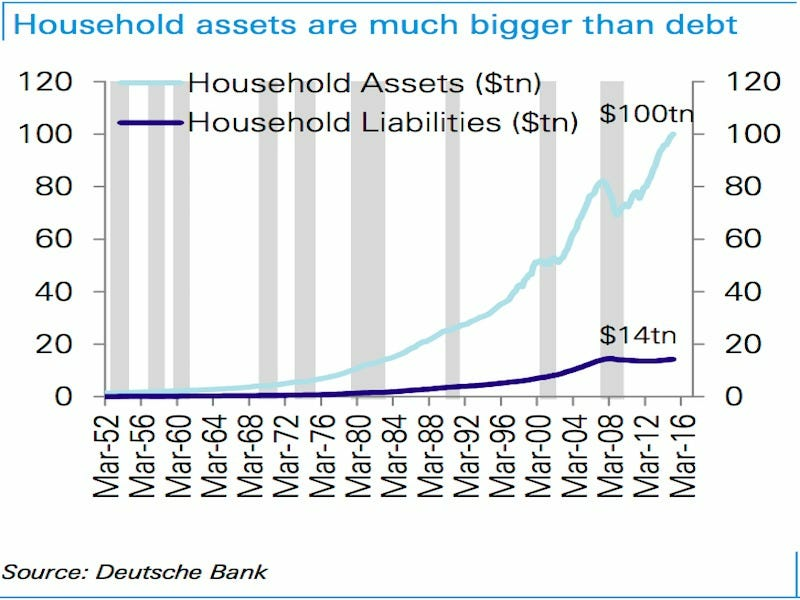 And as Deutsche Bank notes, households in the US have significantly more assets than liabilities. This means that while households benefit from a secondary effect of low interest rates, which has seen things like stock prices and real-estate prices rebound, the primary effect of low interest rates, which lowers the cost of borrowing money and servicing existing debts, matters a lot less. Households have tons of assets relative to liabilities. 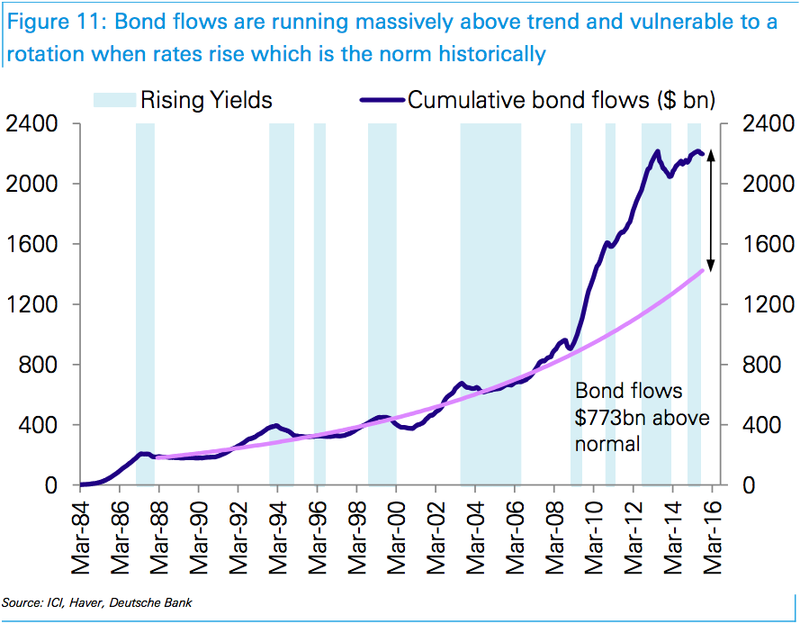 So what low interest rates do is allow governments and businesses to borrow money more cheaply now and, for those who have already borrowed, lower the cost of their outstanding debts through refinancings by pushing their liabilities out to future dates at current prevailing interest rates. And so again, this disproportionately favors businesses and governments rather than consumers. And while there has been a boom in mortgage refinancings — in addition to households being able to obtain new mortgages at lower rates — households simply have more assets than liabilities. The benefits of low interest rates, the primary "blunt tool" of monetary policy, is primarily passed to non-households. But aside from potentially lower mortgage costs, the only other thing consumers really notice about low interest rates is that they get less back from money they park in the bank rather than spend, invest, or do other things with. 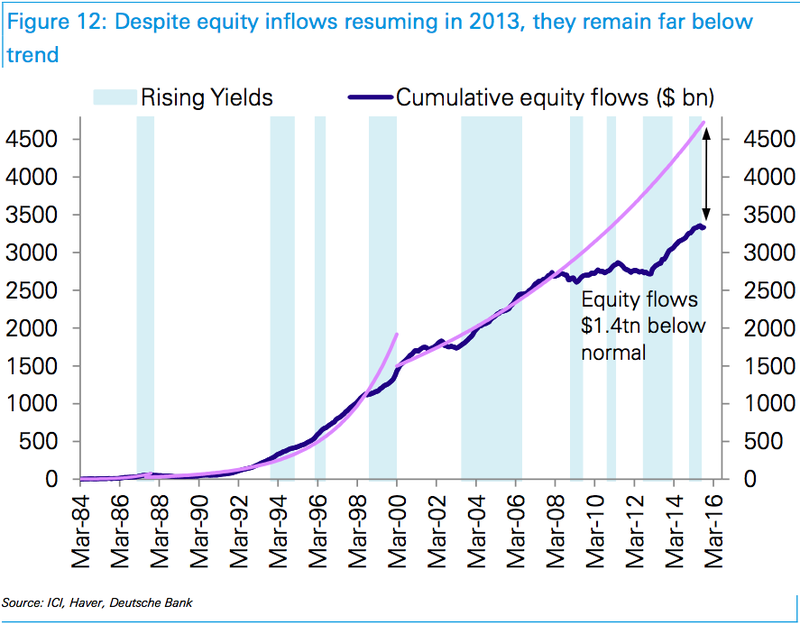 Now, for years ahead of the financial crisis, this wasn't really a problem and consumers acted as expected, as seen in this chart from Deutsche Bank. Interest rates were falling; stock and home prices were rising, bringing up household assets to gross domestic product; and so as a result people saved less as they believed in their ability to spend money now and have enough for retirement. The savings rate has remained stubbornly high. This, then, reversed, as expected, in the financial crisis and people started saving as asset prices declined. But the continued saving of consumers is the puzzle here for central bankers. And thus we arrive at consumers not being or acting like economists. Now, this isn't something economists haven't noticed. But what does still seem to be a problem for policy makers is getting households out of this habit. In other words, central banks have seemingly failed at reducing the savings glut. And the really discouraging part is that Chadha seems to find that low interest rates increase the savings rate because the increase in savings seems largely a manifestation of a fear of not having enough money in the future. So what we've got here is self-reinforcing behavior: I need to save more money today to have enough money tomorrow if the amount my money put away today grows by is 0%. ... and stayed away from stocks, despite the fact that bonds and pure savings accounts are yielding extremely little — on a nominal basis — relative to history. If as the empirical evidence indicates strongly, the household savings rate is driven by a desire to accumulate wealth, it stands to reason that the rate of return on it should impact the savings rate. The rate of return determines the size of the flow income at any level of wealth, so lower rates require a higher wealth target to attain the same target income; and the rate of return affects the speed with which wealth targets can be reached through the compounding of returns, so lower rates of return require more savings to reach the same wealth target. While a number of arguments can be made for why countercyclical monetary policy in the US through lower rates is supportive of economic growth, the encouragement of a lower savings rate (higher consumption rate) is not one of them. Indeed the empirical evidence is strongly to the contrary: lower rates look to be lowering the consumption rate and lowering aggregate demand. About a month ago, we chronicled how consumers ended up spending more on gas — despite lower gas prices — right before the financial crisis because of how they budgeted their money, viewing it as committed to certain purchases rather than seeing it as truly fungible. And over the last several months, Nobel laureate Robert Shiller has talked about how it is not our hopes for the future but our anxieties that are driving up stock prices, another clear sign of irrationality among actors many economists assume are acting in a rational manner. Were Hedge Funds Right About Piling Into Owens Corning (OC)?